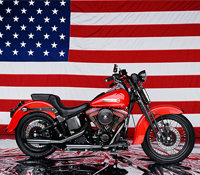 When you need to ship a motorcycle within the United States, Premier Motorcycle Transport makes it easy and affordable. Servicing every city and state in the country, there's nowhere our advanced network of certified carriers can't go. Whether you need to ship a motorcycle coast to coast or 100 miles, our team of transport professionals are standing by to ensure that you have a positive shipping experience. Select your pick up state below for more information about shipping a motorcycle from that state. "Impressed with the way Premier handled our shipment"
We're very happy we found Premier to help us ship our bike around. "Everything about the transport went just as planned"
Customer service was awesome both by the transport agent and the driver. "Premier delivered my bike on time & in perfect condition"
No matter where you need your motorcycle to go, Premier can get it their safely. We service the entire United States - including Hawaii, Alaska & Puerto Rico. Whether you're shipping coast-to-coast or just a state away, we can provide you with dependable transportation. Your motorcycle will be transported on a fully enclosed motorcycle shipping carrier. Enclosed carriers provide maximum protection while in transit and protect your motorcycle from any outdoor elements while en route to the destination. All motorcycles are secured onto a heavy duty metal pallet using soft tiedown straps on the front and rear of the bike. This is the safest way to load a motorcycle onto the carrier and ensures a stable ride for the duration of the shipment. Calculate your nationwide motorcycle shipping rate instantly by completing the quote request form to the left. Take advantage of our affordable US shipping rates and save up to 50% from average pricing by other motorcycle transport companies. Need Help Your Nationwide Motorcycle Shipping?